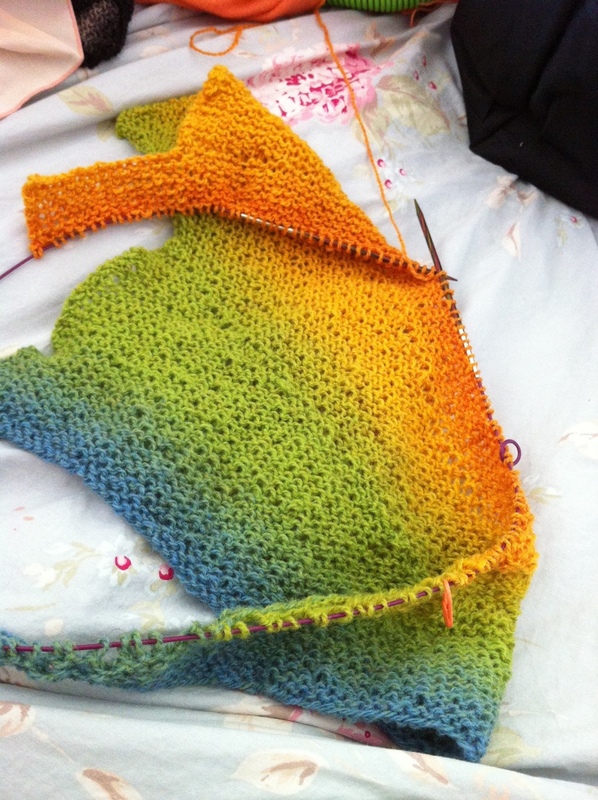 I am cranking along on my rainbow Kauni Wingspan scarf! Just a few days ago it was just a mere baby with a few rows cast on. The next day, a nap-free day mind you, it had quickly grown in my hands with barely any effort. The changing colors are such a pleasure to watch from shade to shade. 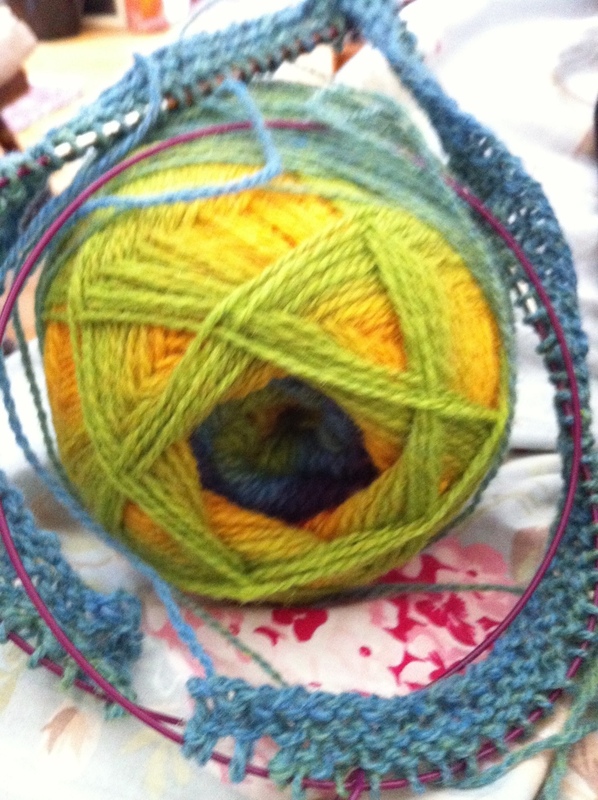 Today I am working on the 7th triangle in the pattern and I have gone through the entire spectrum. I hope to finish this tonight or tomorrow but I am watching Gene Wilder’s “Haunted Honeymoon” and it’s so funny I keep forgetting what I’m doing! In other happy news my extra ball of Kauni yarn arrived in the grey/black colorway and I have an exciting yet simple (brainfree) shawl I am going to start next. I am very pleased to be able to find knitting projects that can keep me occupied while I am healing and in the “bear of very small brain” phase. 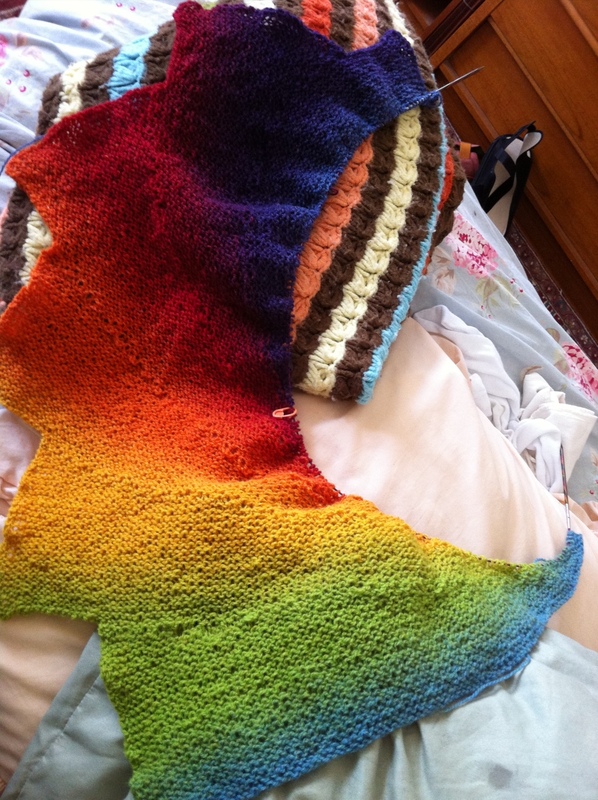 Posted in knitting and tagged Kauni, knitting, Wingspan. Bookmark the permalink. While I’m healing from surgery I realized my brain just isn’t up to any kind of complicated patterns but yet I crave the solace and comfort of knitting. 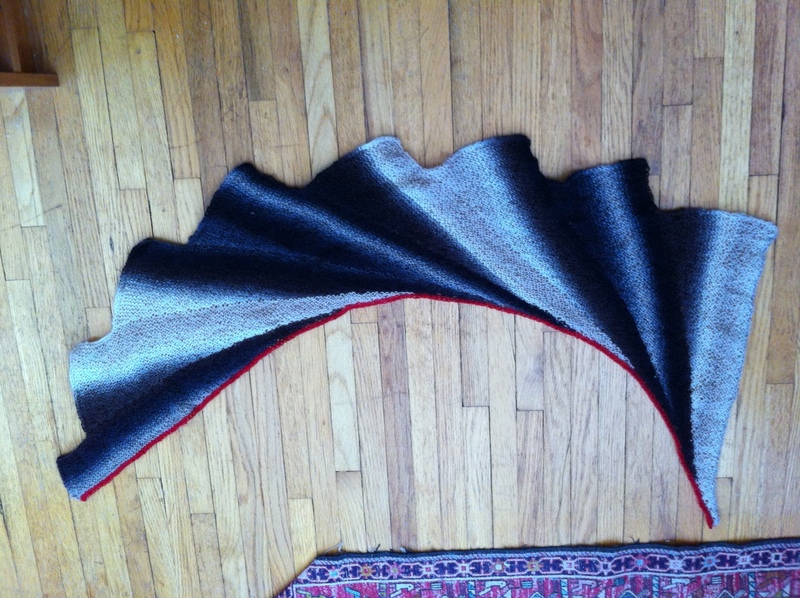 Behold the perfect answer to my needs: the Wingspan scarf. My new friend from Twitter, Carol-Alyce from Wales and my knitting buddy Chris from Vermont, were chatting about this pattern and Carol-Akyce shared a particularly beautiful one she made in a shaded black-charcoal-white Zauberball yarn trimmed in crimson. see all the colors people had used to knit their Wingspans. 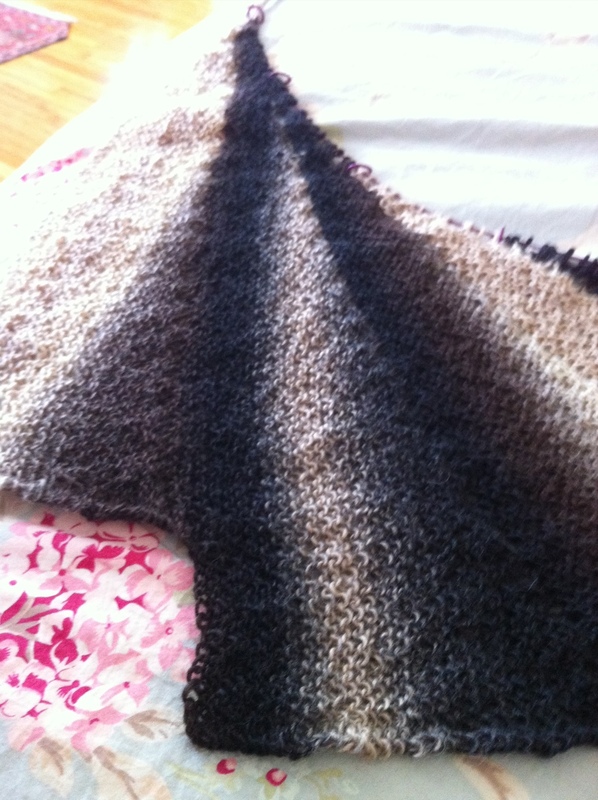 My heart was smitten by Carol-Alyce’s though, and then I found Zauberball made a colorway of shades of chocolate yarn and ZING! 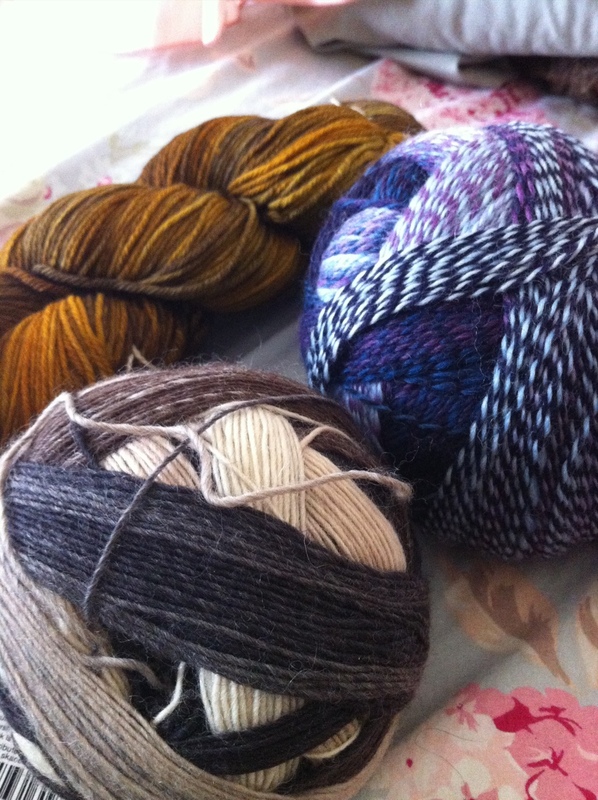 I treated myself to a small purchase from Simply Socks Yarn Co and it arrived my first day at home after my fab weeklong sleepover at D___’s – aka post surgery recuperation. 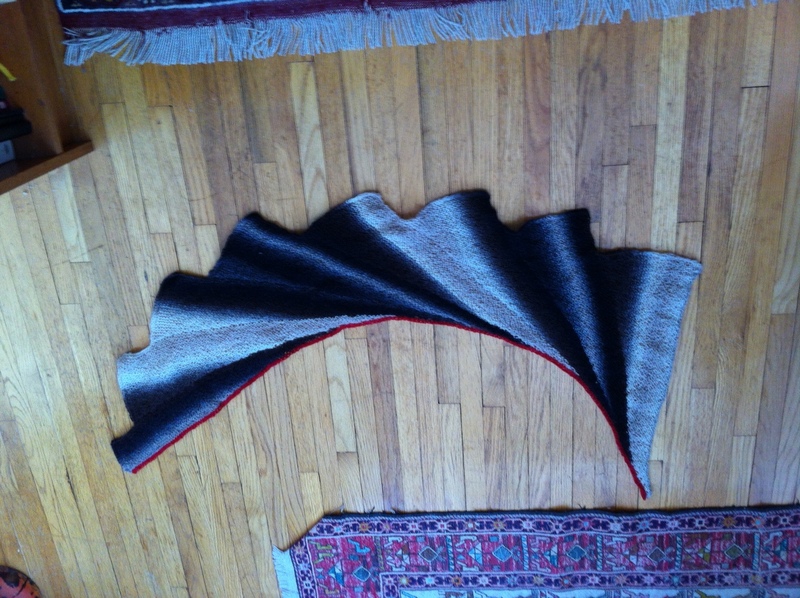 The Wingspan is very simple to knit, just garter stitch, and it is a truly beautiful and yet mindless pattern. 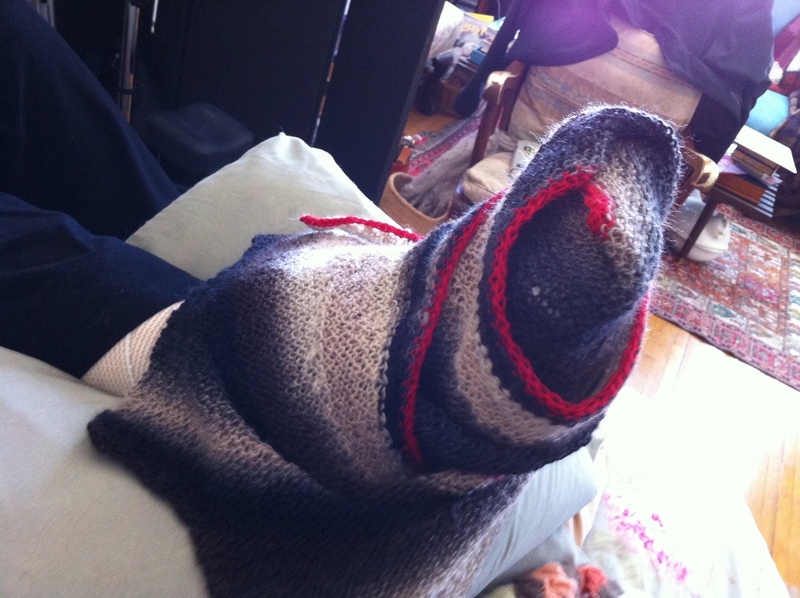 I could knit this when cranky and uncomfortable from pain, on pain medication and half asleep. It’s perfect!! By last night I was done, with 7 1/2 pattern repeats. I found some scarlet Kauni 8/1 yarn in my stash and did a quick border to add a splash of brightness to the scarf, just like Carol-Alyce’s. How I love this scarf, and so does my dear friend A___ whom I feared would never take it off when she helped bring my home from my post-operation doctor’s visit. It looked divine on her, and I’m hoping she will make one, or I will! I have already started a new Wingspan in Kauni 8/2 in EQ, the rainbow yarn, and it is so much fun to knit while watching goofy tv and movies while I’m stuck at home. 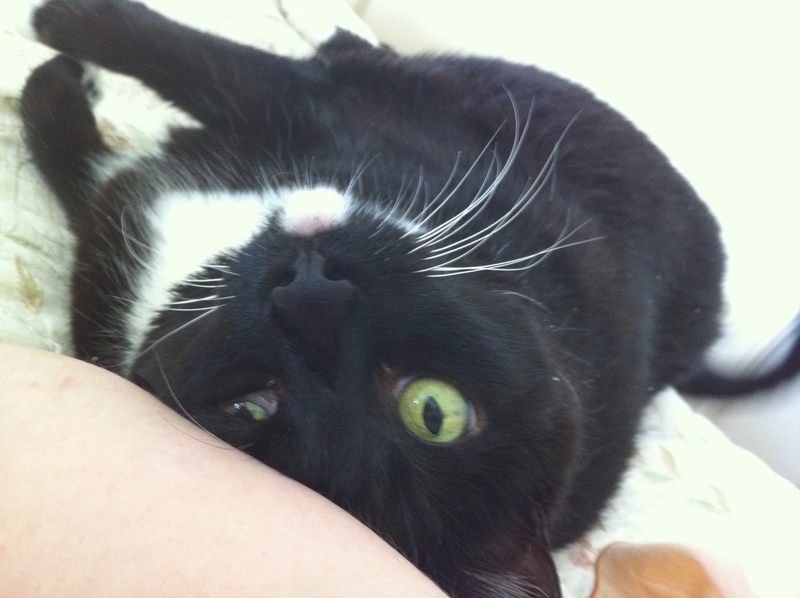 Knitting is such a relaxing activity for me, and yet it feels very odd to be knitting something that my darling Pogo hasn’t tried to lie upon or sniff out the yarn, I miss him so. It’s a good thing yarn is absorbent because I’m using it to sop up my tears that just flow and flow. The rainbow color shifts reminded me of the sweet poem about the Rainbow Bridge and so that’s what I’m calling it – Rainbow Bridge Wings, wings to help me heal my heart from missing my sweet Pogo. 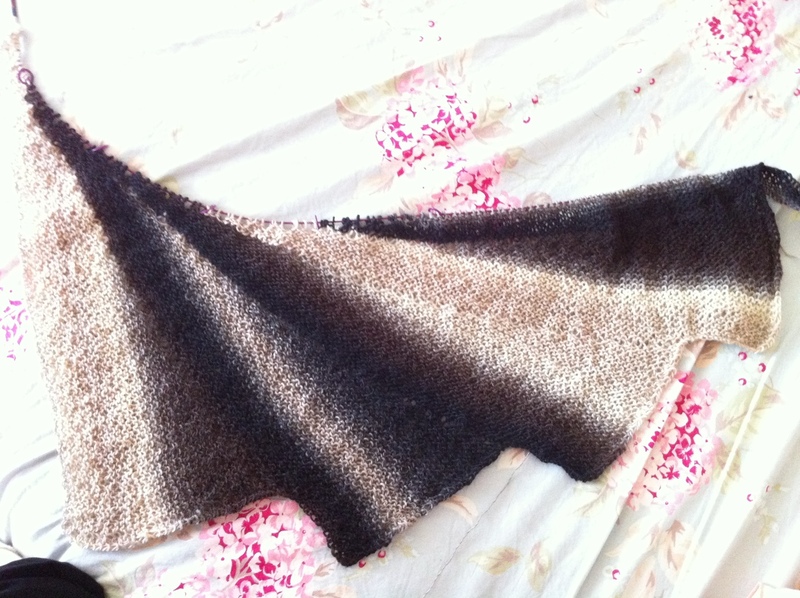 I am just going to keep knitting simple projects like this one until I can finish the Clapotis and try not to think. The pretty colors are nice and distracting. Here’s to another six weeks filled with knitting and physical therapy and more knitting. 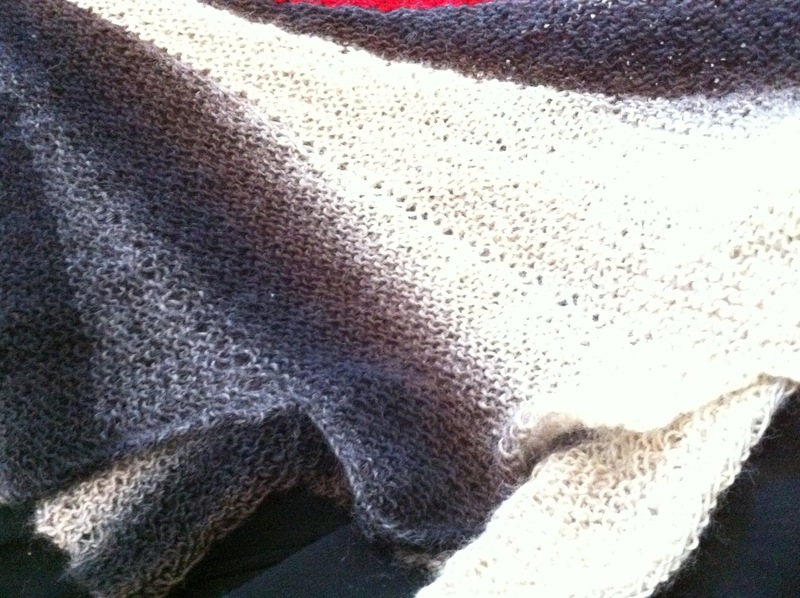 Posted in knitting and tagged healing, knitting, Ravelry, scarf, Wingspan, Zauberball. Bookmark the permalink.